Add sugar, cloves and water in a sauce pan. Let it boil on medium heat. Syrup is done when it reaches to single thread consistency or 220 degrees on the candy thermometer. Take besan, yellow food color in a mixing bowl. Add little water at a time and mix well. Pour some batter on ladle with round holes. If the batter drops fall right away, then the consistency is right. Otherwise add some more water and check again. Meanwhile heat oil in a pan for frying the boondi. When syrup is about to done, start making the boondi. Keep the ladle above the frying pan and pour batter on it. Tap it gently, so that drops of batter falls into oil. Fry boondi till slight golden color. It will take around 2 minutes. Remove all boondi from oil and put directly into a sugar syrup. Follow the same procedure till you are out of batter. Once the boondi absorbs sugar syrup and turns little warm, add cardamom powder and cashews. Take out the cloves which we added while making syrup. Make medium sized ladoo from boondi mixture. Let them cool down completely. Store them in a air tight container. Wow Ladoo!! Feel like grabbing one from the screen.. Very nice..
Poonam, Ladoo are so delicious.I m going to try these.Thanks for sharing this blog. Ladoo's are something I love making and love eating anytime. I love ur layout changes dear....looks great.....boondi ladoos too look very very tempting ! Delicious and tempting ladoos. Wonderfully prepared. Ladoos looks perfect and yumm....love this...looks delicious. 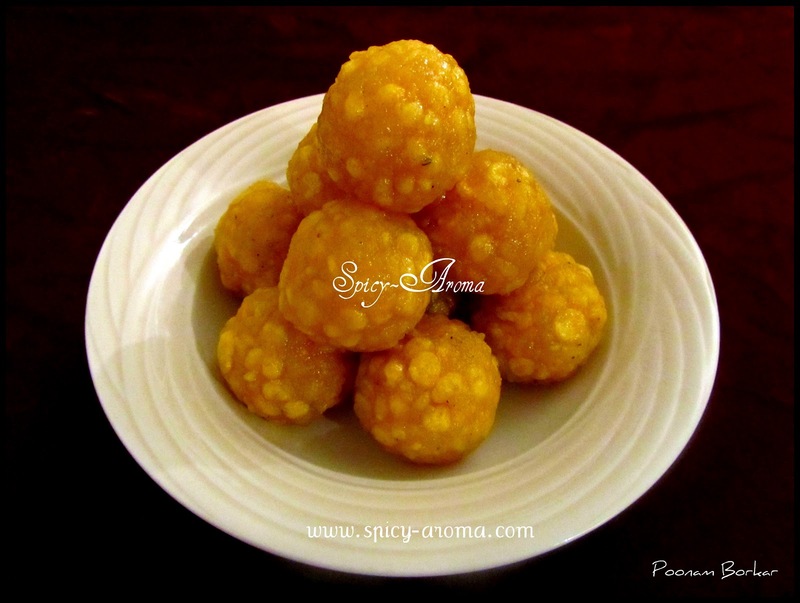 Boondi ladoo looks perfect n yummy. Wish I could grab gone,looks divine. OMG Home made ladoos look superb. Well done dear. Looks so tempting and delicious. Perfect. perfect boondhi laddoo...looks so delicious,feel to grab one....tempting!!!!!! these look so tempting poonam.. perfect! aaj fir se ek baar aur mummy ki yaad dillai gayi hai...door baithe bachchon ko !!! Yumm, looks so perfectly done..
sooo good..I will surely give it a try as it used to be my favourite childhood sweet..